If you need a professional security service in Akron, Canton, Cincinnati, Cleveland, Columbus or Ohio, then Willo Security can help. They offer a variety of security related services including security planning, security guards, event security, patrols, armed response, body guards and investigation services. Willo has been in the security industry for a long time and they have hands on experience in providing comprehensive and effective security services. When it comes to security service, they know how to do things and implement the right solutions and provide an effective service. They know that each situation is unique and related security challenges can be diverse. Whatever your situation, they will analyse your current security setup and they will make the required recommendations and improvements. Maybe you need a security service for a planned event or function. Maybe you need security for access control or for presence in a shopping mall. Whether you need unarmed guards, armed guards, patrol guards or body guards, Willo Security can help. Maybe you are a high-profile individual and need a body guard service. Maybe you are facing unexplained losses and require an investigation service. 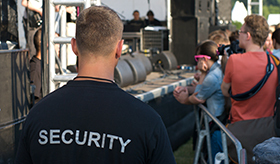 A professional security service often includes security planning, site inspections, access control, crowd management, mobile patrols, emergency response, armed response and incident management. Whatever your security concerns, Willo can provide the proper service and solutions. They specialize in providing security services throughout Akron, Canton, Cincinnati, Cleveland, Columbus and Ohio.